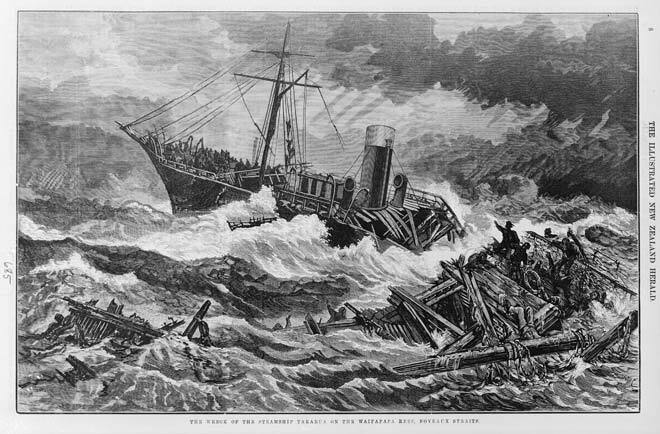 The second greatest loss of life in New Zealand waters came in 1881 when 131 people died in the wreck of the Tararua. On a voyage from Port Chalmers to Melbourne, the ship struck a reef off Waipapa Point, Southland, at 5 a.m. on 29 April. A passenger swam ashore to raise the alarm, but the rough sea made it too dangerous to take people off. The ship began to break up, and the passengers climbed the rigging. They hung on until 2.35 a.m. the next morning, when those on the beach heard piercing shrieks. By daybreak the ship had sunk, and bodies were floating ashore. Only 20 of the crew and passengers were saved. Six weeks after the Tararua sank, the papers were still full of some of the strange stories resulting from the event. Download the document to read an extract from the Illustrated New Zealand Herald of 16 June 1881, which includes some tragic and interesting accounts (63 KB).